Mark's Tickets is the best place to find tickets for Slayer fans. Just check this page for any new events or schedule updates throughout the year. We sell tickets to every Slayer concert around the world. We know how passionate Slayer fans can be about hard rock & metal music, so we make sure to have hundreds of tickets for every concert available right up until showtime. For those looking for cheap Slayer tickets, we offer tickets starting at very low prices (many times below face value). We offer tickets in most sections of every venue that Slayer performs. Simply choose the city or venue that you are interested in below, and you will be able to see all of the available seats. Do not forget that Marks Tickets also specializes in sold out Slayer tickets. No longer will sold out shows prevent you from seeing Slayer. Slayer is an American thrash metal band formed in Huntington Park, California in 1981 by guitarists Kerry King and Jeff Hanneman. 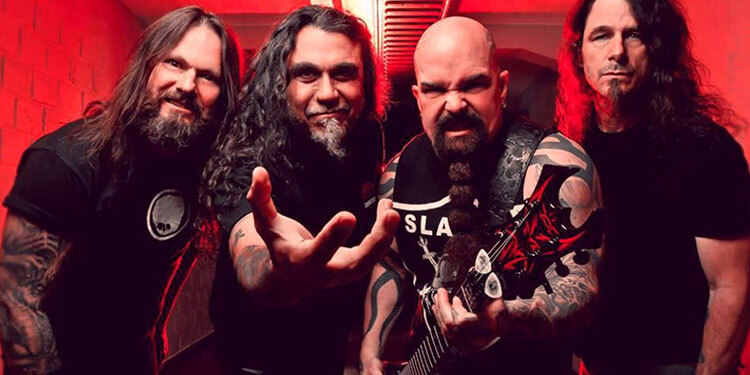 Slayer rose to mainstream fame with their 1986 release Reign in Blood, and is credited as one of the "Big Four" thrash metal acts, along with Metallica, Megadeth and Anthrax. Slayer's sales are in the estimated high 20 millions, although they have never publicly announced their sales worldwide. However, between the years 1991 and 2004, Slayer sold over 3.5 million albums in the U.S.Slayer's musical style involve fast tremolo picking, double bass drumming, and shouted vocals. In the original line-up, King, bassist/vocalist Tom Araya and guitarist Jeff Hanneman contributed to the band's lyrics, and most of the band's music was created and arranged by King and Hanneman, with additional help from drummer Dave Lombardo and sometimes Araya. The band's lyrics and album art, which cover topics such as serial killers, necrophilia, Satanism, religion, anti-religion and warfare, have generated album bans, delays, lawsuits and criticism from religious groups and the public. Their music has been highly influential, often being cited by many bands as an influence musically, visually and lyrically.Since their debut album in 1983, the band has released two live albums, one box set, six videos, two extended plays and eleven studio albums, four of which have received gold certification in the United States. The band has received five Grammy nominations, winning two of them. One in 2007 for the song "Eyes of the Insane", and one in 2008 for the song "Final Six" (both from 2006's Christ Illusion). Slayer has played music festivals worldwide, including Unholy Alliance, Download and Ozzfest.